Grave Matters is a quest in Hellfire. This quest unlocks the entrance to the Crypt, the second set of new levels added in the expansion pack. Triggered By: Finding the Cathedral Map. Frequency: Every game in Hellfire. Location: Hive Level 4, then the Town graveyard. Reward: Access to the Crypt. This quest follows The Defiler quest. After killing the screeching, insecticidal Defiler and picking up the Cathedral Map, speak to Gillian activate the quest. 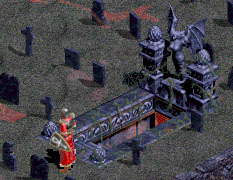 Then take the Cathedral Map and take it to the cemetery and drop it on the large, ornate grave (this is the only change to the cemetery from how it looked in Diablo). 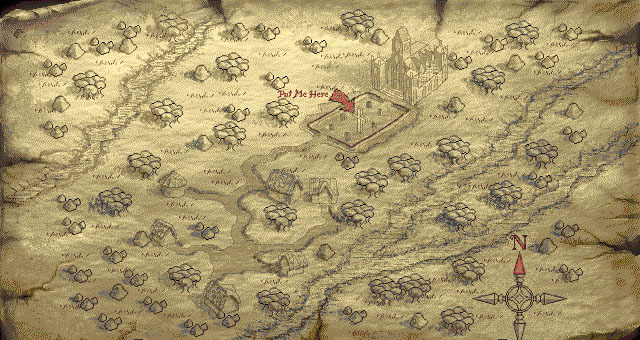 If right clicked, the cathedral map opens up to show an overhead view of Tristram, with an arrow pointing to the graveyard. Whether you speak to Gillian or not, the quest works the same way. Walk to the cemetery, drop the map on the new grave, and it will slide away leaving a stairway down to the Crypt. The Crypt was designed to be equivalent in difficulty to Hell (levels 13-16). That's the official word, anyway. If any non-sorcerer players actually feel that way they've kept a low profile, since the unanimous conventional wisdom is that the Crypt is much easier than Hell, if only because the floorplan, reskinned from the Cathedral (levels 1-4), offers so many doorways to bottleneck the enemies and small rooms to chase down ranged attackers in. As with the Hive, there is a great deal more monster variety in the Crypt than in any of the original areas of Diablo. While Hell and the Caves never offer more than 2 or 3 monster types, 6-8 is the usual amount for each level in the Hive and Crypt. The one big difficulty of the crypt is for Sorcerers, since the enclosed areas and multiroom layouts make effective use of Chain Lightning difficult. The immunities oversight made by the original D1 team is corrected as well, since unlike in any area of Diablo, the Crypt holds plenty of monsters with fire and lightning immunities, who can only be attacked by magic. Blood Star and Flash are necessary skills here for a sorcerer, after they were nothing more than novelties in Diablo. The Cathedral Map gives a bird's eye of Tristram, and even includes instructions on how to use it. My grandmother often tells me stories about the strange forces that inhabit the graveyard outside of the church. And it may well interest you to hear one of them. She said that if you were to leave the proper offering in the cemetery, enter the cathedral to pray for the dead, and then return, the offering would be altered in some strange way. I don't know if this is just the talk of an old sick woman, but anything seems possible these days. Maintain your quest. Finding a treasure that is lost is not easy. Finding a treasure that is hidden less so. I will leave you with this. Do not let the sands of time confuse your search. There was a tine when this town was a frequent stop for travelers from far and wide. Much has changed since then. But hidden caves and buried treasure are common fantasies of any child. Wirt seldom indulges in youthful games. So it may just be his imagination. Listen here. Come close. I don't know if you know what I know, but you've have really got something here. That's a map. A what?! This is foolishness. There's no treasure buried here in Tristram. Let me see that!! Ah, look these drawing are inaccurate. They don't match our town at all. I'd keep my mind on what lies below the cathedral and not what lies below our topsoil. I'll bet that Wirt saw you coming and put on an act just so he could laugh at you later when you were running around the town with your nose in the dirt. I'd ignore it. I really don't have time to discuss some map you are lokking for. I have many sick people that require my help and yours as well. Hmmm. A vast and mysterious treasure, you say? Mmmm. Maybe I could be interested in picking up a few things from you. Or better yet, don't you need some rare and expensive supplies to get you through your ordeal? This is a place of great power. This page was last edited on 9 October 2011, at 06:51.